It is the location of the summit of the sacred mountain Gassan and having the mountain at it's origin, the clear stream Tachiyazawa-gawa River flow along one of the 3 big rivers of Japan the "Mogami river". 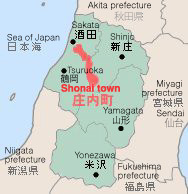 Shonai-machi extends over a long but thin terrain from south to north. During wintertime, the closer you get to the southern edge, the more you will see snow. As for the northern parts, there are many very strong seasonal winds and from Spring to Fall a powerful wind that comes from the Mogami ravine called the "Kiyokawadashi" also exist. Those strong winds are being used as wind power generation. In addition, as a rice place, it is know throughout the country. "Kame-no-o" which is the origin of Sasanishiki and Koshihikari was brought up by Abe Kameji. ※On July 1, 2005, Amarume-machi and Tachikawa-machi merged and became Shonai-machi. Eight windmills standing as symbol which succeeded in using wind of difficult person in life proudly in rural district of Shonai plains are impressive.